Versatility, Reliability, Accuracy and Portability are the advantages that make the Gollehon Extendable Goniometer an innovative tool in the assessment of range of motion. Its arms can extend to 28.00 inches to measure large joints and retract to 8.0 inches to measure all but the smallest joints. Unlike standard goniometers that require the examiner to estimate alignment, the length of the extendable arms allows it to lie over anatomical bony landmarks. The dual scale of 0-180° and 180-0° is magnified four times, improving the accuracy of the reading, thus, reducing the chance for error. 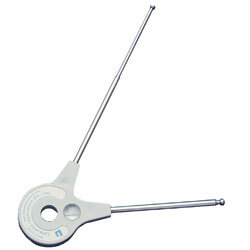 The Extendable Goniometer is affordable, costing little more than standard goniometers. Its lightweight ABS plastic construction will ensure continued and long lasting use. The Extendable Goniometer features a Dual Scale, 1° Increments, Extendable and Retractable Arms, Magnified Reading Window, as well as a Compact, Lightweight, and Portable Design. 10 replacement antennas for the Model 01135 Extendable Goniometer.